Anda Do Pyaz is the very easy and quick dish which can be done in just few minutes. 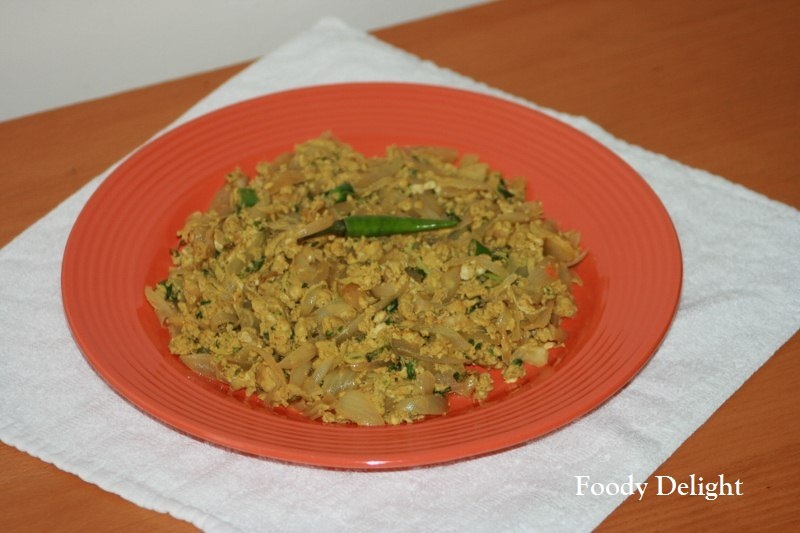 This recipe is just similar to normal egg burji but quantity of onion used in here is double in quantity. Like if your thinking of 1 onion in egg burji. You will be using 2 onion in do pyaz recipe. And very important is sliced onions are used in this recipe, not chopped one.This was just an example or I can say just I wanted to tell in detail. Slice the onion, chop the green chillies and cilantro. Break the egg and beat them. Into one bowl, add in all dry powder . Mix well and keep it aside. Heat a non stick pan and add oil into it. When oil heats up, add cumin seeds and let it splutter for few seconds. Then add sliced onion and fry till they are tips begins to change its colour. Add beaten egg and mix well. Here you need to stir the egg continuously to avoid sticking. Meanwhile add powder mixture, chopped chillies and chopped cilantro. Mix everything well. Anda Do Pyaz is ready to serve hot.